Audi’s second-generation A1 will hit UK roads before the end of the month with more interior space and a raft of new technology. The popular supermini has been redesigned from the ground up and has been stretched by 56mm. Now measuring 4.03 metres from tip to tailpipe, the longer A1 means a much roomier cabin and loads more leg room and boot space than before. As such, the A1 will only be available as a five-door Sportback with the three-door model being consigned to the history books. The new A1 Sportback will be offered with three specification options: SE, Sport and S line. Every A1 will feature Audi’s fully digital instrument cluster with a high-resolution, 10.25-inch display and a multifunction steering wheel as standard. The S line model goes all out by adding larger air inlets, additional sill trims, an elongated slit centrally below the bonnet with two fins and a larger rear wing. A standalone specification – S line Competition – will sit above the range-topping model from early 2019. This extra special variant throws in unique 17-inch platinum grey alloy wheels, red brake calipers, platinum grey door mirrors, sports suspension with adjustable dampers and twin tailpipes. Furthermore, two striking special edition models – the A1 S line Contrast Edition and S line Style Edition – will build on the S line spec by adding a range of vivid colours and a more sporting slant, as well as darkened LED rear lights and large 18-inch wheels in either bronze or black, depending on the exterior finish. 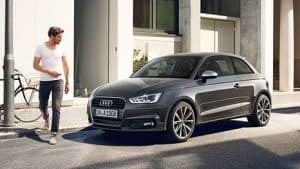 Initially, the new Audi A1 will only be available with one engine choice: a one-litre three-cylinder petrol with 114bhp, labelled as 30 TFSI. It should pack enough pep, getting the A1 up to 62mph in 9.4 seconds when linked to the seven-speed S tronic version (9.5s for the six-speed manual). Speed tops out at 126mph in both variants. On 15-inch alloy wheels, it emits 108g/km of CO2 and returns 58.9mpg. A trio of petrol engines are set to join the A1 range not long after launch. These are the 94bhp single-litre 25 TFSI, the 148bhp 1.5-litre four-cylinder 35 TFSI, and a two-litre 197bhp TFSI. The latter will only be available in the S line Competition trim. Prices for the new A1 start from £18,450 for the 30 TFSI SE manual, jumping to £20,080 for the auto. Sport models ring in at £20,010 and £21,530 for the manual and auto respectively, while the S line carries a list price of £21,660/£23,180 (manual/auto). At FCS Europe, our people are the heart of our business and we are constantly striving for excellence. Our consultative and knowledgeable approach to everything we do sets us apart and we are always looking for new people to join our ever-expanding business. Over the past few years, we’ve seen some amazing growth, from a new office in Halifax to a new office in a new country: Germany. For us, standing still is not an option. Looking for progression? With offices in Bellshill, Whitstable, Wantage, Leeds, Burnley, Halifax & Essen, Germany, we’ve got you covered! Just ask our managing director Denise and she’ll tell you that the opportunities are there for the taking! Join us today and fuel your career with FCS Europe.